With the Sawyer Mini Water Filter system, clean water has never been easier to obtain! The Sawyer MINI Water Filter is rated to 0.1 micron absolute, weighs only 2 ounces, and filters up to 100,000 gallons! This award winning system is reliable and easy to use. Eminently adaptable to most any situation, the MINI can use the included collapsible drinking pouch, attach to inline hose on a hydration pack, on a standard soda bottle, or simply use the included drinking straw to drink directly from the water source. The kit is so light there is little reason to leave it at home. Like all Sawyer filters, a proper backwashing can restore up to 98.5% of the filter’s flow rate. That means no expensive cartridges to replace, ever. 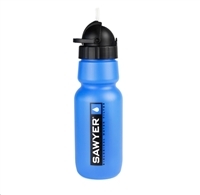 Take Sawyers amazing MINI filter capable of filter of providing 100,000 gallons of fresh potable water, combine it with a purpose built bottle with a drinking cap and you have the perfect combination! Easily configured to meet your water filtration needs, attach it to the included squeeze pouch for on the go, a 5 gallon bucket for a base camp, or directly to your faucet when municipal services fail to purify water but can still supply it! While you need potable water, you no longer need to expend time and energy pumping old school filters! Just fill the gray water bag and let gravity do the work and enjoy your water in as little as 1.5 minutes. We here at Huckleberry Arms were not content to sell these systems incomplete without a bite-valve like you will find elsewhere, so have sourced and are now including one with each system free of charge as an added benefit of shopping with us!